Saturday 1st October, 11am – 1pm. Meet at Broompark Drive gardens, Dennistoun (Street View). Gloves, bags, litter–pickers provided. Please wear suitable clothing. Coffee and cake provided for participants! 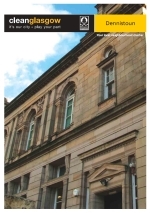 Click here, or on the thumbnail image, for a PDF of the Dennistoun Clean Glasgow neighbourhood charter. I am in the process of taking over a shop at Dennistoun cross. The shopfront is in a serious state of disrepair. I have been told that government grants exist to assist in renovations of this type. Could you advise if you are aware of any such initiatives. • For general funding advice we’d suggest Business Gateway on Buchanan Street. Many thanks for this. I shall pursue these avenues.